The Anderson Powerpole has been adopted by the amateur radio community as their standard 12-volt DC power connector for everything from radios to accessories. Powerpoles provide a more reliable electrical connection, both mechanically and electrically, and are easier to adapt to a wider range of wire gauges. Powerpole connectors are physically and electrically "unisex", thus avoiding the need to worry about which end is the plug and which the socket, or which end has the correct polarity. 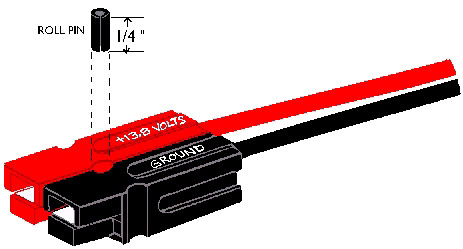 For use in amateur radio, the community has adopted a standard polarity for assembling the connectors using one red and one black housing. A useful mnemonic for remembering the arrangement for the positive connector "Red Right—Tongue Top". Many sizes of the Powerpoles are available, however the size most commonly used is the 15/30/45 ampere variety. These sizes all use the same plastic housing in multiple colors, differing only in the metal contact inserted into the housing. The metal contact is selected based on the amperage and wire size.